The instrument cluster is all new as well, taken heavy inspiration from the now defunct Bravo. The new cluster has large pods for the speedometer and tachometer (with smaller ones for the temperature and fuel gauges) with a large rectangular display in between for the multi-information system (which shows an array of data) and other tell-tale functions. At first glance, the cluster doesn’t appear as easy to read on the move as the one on the old Linea but with time it grows on you. The old Linea had an open storage space right above the centre AC vents, the new one has a closed one. One cup holder has been removed at the front, right below the AC controls as Fiat has now placed the AUX and USB ports in lieu. The Linea 125 S is powered the same 1.4-litre turbo-petrol T-Jet engine as before, though its different state of tune results in an increased power rating of 125hp as compared to the earlier cars 114hp. The manner of delivery of this power, however, is the real highlight, the engine has enough low-range torque to allow you to potter about town comfortably and post the 2,000 rpm mark things really pick up robustly all the way up to 6500rpm, with power delivered in a linear and continuous fashion. Engine noise is well-contained at lower revs, and though you can hear it at higher revs, it is not unpleasant or unbearable.The rev-happy engine should have been complemented with a better gearbox. Gear shifts aren’t sporty and feel rubbery. All the variants except T-Jet versions come with disc and drum braking mechanism, while the T-Jet variants are loaded with disc brakes for all four wheels. Adding to this, the anti lock braking system and electronic brake-force distribution makes driving for more predictable. This ABS feature is available as standard for Dynamic, Emotion and all T-Jet variants. The Linea gets a superior suspension system as well. This car’s front axle has an independent wheel type of layout and the rear one gets a torsion beam type of mechanism. Both these axles are further loaded with helical coil springs along with double acting telescopic dampers and stabilizer bars that enables it to deal with all the irregularities on the roads. Not but the least, this sedan gets a highly responsive power steering system that makes for a predictable handling. Fiat Linea 1.4l Active Fire Ex-showroom Price is 7,01,819/- and On Road Price is 8,15,764/- in Hyderabad. 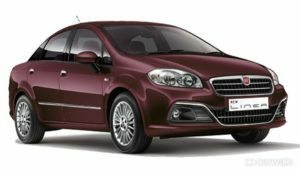 Fiat Linea 1.4l Active Fire comes in 5 colours, namely Magnesio Grey,Sunbeam Gold,Tuscan Wine,Hip Hop Black,Minimal Grey.Apply car loan for Fiat Linea.